On April 1st the Daily Mail published a map of UK broadband speeds under the headline “How fast is your broadband” and said that 1.5 million users still have “below minimum” speeds. I would like to be able to tell you that was an April Fool joke, but it wasn’t. O2 has just called for a rebalancing of UK network investment outside London and the South East. However, in the Daily Mail map, much of Inner London was “yellow” (the colour of slow speed Britain). On the same day we saw press cover for an FISP study calling for the new mayor of London to take drastic action because over a million Londoners are unhappy with their broadband speeds and only a third believe London has the capacity to meet future needs. Those poor London people – perhaps they should come and join us here in Suffolk and East Anglia where our ALL OVER SPEED is London’s slowest speed. Below is the Daily Mail’s Map of East Anglia. 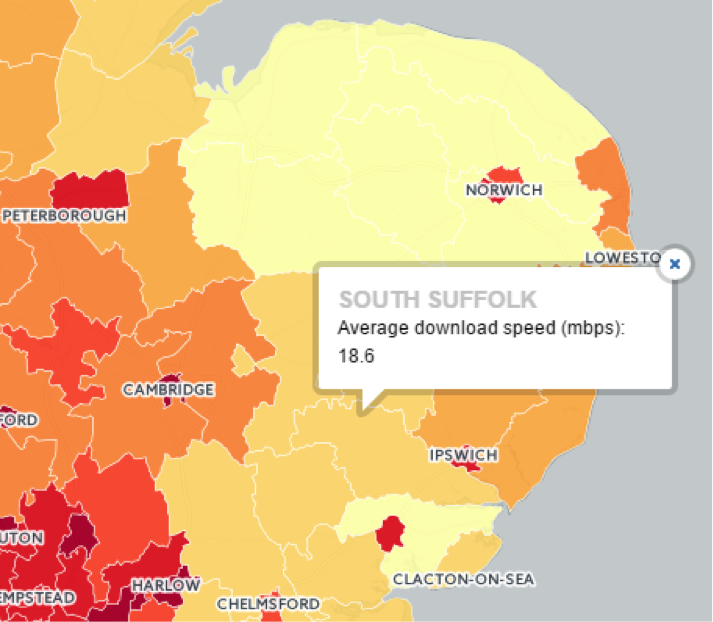 The Better Broadband for Suffolk website shows a map that is more detailed and clearly shows that much of the infrastructure is ‘under consideration’ between 2016 and 2019. The darker areas on the map will benefit from fibre broadband by September 2016, however in some cases not all premises within these postcodes will be updated. The areas shown in orange are currently under consideration for fibre broadband between 2016 and 2019. Once the plans are released the map will be updated. We thought we would check out to see what’s in store for our postcode here at MPM IT.